Authentically Me: 10 Fun Facts! It’s Friday, and I needed a mid-afternoon break from work, so I thought I’d write a quick post and share 10 fun facts about me to help you get to know me a little better. There is no stop sign, blinking red light, or stop light on the “main drag” in my hometown of Thorp, WI. My family lived on a small dairy farm for the first 8-ish years of my life. Running barefoot on the gravel and through the cow pastures and fields was “the norm” back in the day. I learned quickly that running barefoot across a hayfield was a bad idea (feet full of splinters!!). My first car was a manual-transmission Chevy S-10 pickup truck. I ate nothing “green” other than peas and green beans until the first salad I tried at Olive Garden near the end of my freshman year of college at UW-Eau Claire. 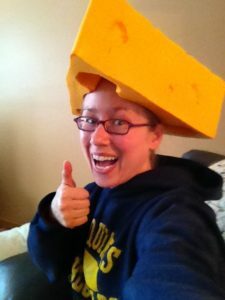 I LOVE the Green Bay Packers, have been to Lambeau field in sub-zero temps dressed like a snowman, am a proud owner of a cheesehead, and often engage in friendly banter with students at the University of Minnesota Duluth who are Vikings fans. I enjoy pushing boundaries related to my fears. For example, I’m afraid to stand on a stool, but I have done two tandem skydives. Check out this amazing video that my friend, Amy, made of jump #2! I packed up my things to move halfway across the country to spend the summer in New York City. Bonus Fun Fact! I trained my dog, Hurricane, how to walk on a treadmill so he could get his exercise during the winter when I had broken my wrist and was unable to go for long walks on the icy sidewalks. Don’t believe me? Here’s a link to a short video. P.S. Sharing these with you is a “toward move” for me, as sharing my authentic self in all I do is something that matters to me.